Phase-folded K2 light curve of EPIC 228735255 (black points) with best-fit model plotted as a solid red line. Top panel: Full phase light curve with the transit of EPIC 228735255b. There are no other significant dips indicating any other transits. Middle panel: Zoom-in of the transit of EPIC 228735255b and the resulting residuals from it and the model fit. Bottom panel: Zoom-in around phase 0.5. There is no indication of an observable secondary eclipse. Credit: Giles et al., 2017. (Phys.org)—An international team of astronomers has identified a new extrasolar planet from the data provided by Kepler spacecraft's prolonged mission known as K2. The newly found exoworld, designated EPIC 228735255b, is a so-called "hot Jupiter" on an eccentric orbit around its parent star. The finding is detailed in a paper published June 21 on the arXiv server. The new alien world was first spotted by K2 as a planetary candidate during the spacecraft's Campaign 10 in July 2016, when it obtained the light curve of the host star EPIC 228735255, which is similar in size and mass to our sun. In order to confirm the planetary status of the newly identified object, a team of researchers led by Helen Giles of the Geneva Observatory in Switzerland has carried out follow-up observations using ground-based telescopes. The astronomers employed the CORALIE spectrograph on the 1.2-m Euler Telescope and the High Accuracy Radial Velocity Planet Searcher (HARPS) mounted on the ESO 3.6-m telescope, both at La Silla Observatory in Chile, to conduct radial velocity measurements of EPIC 228735255. Additional photometric data was provided by three Las Cumbres Observatory (LCO) 1-m telescopes located in South Africa and high angular resolution imaging of the star was obtained by the Robo-AO instrument mounted on the Kitt Peak 2.1-m telescope in Arizona. The observations, carried out between February and April 2017, allowed the team to definitively confirm that the object first spotted by K2 is, indeed, a planet, and to derive fundamental parameters of the system. "We found a 'hot Jupiter' planet in data from K2 Campaign 10 and followed it up with radial velocity measurements and high angular resolution imaging," the researchers wrote in the paper. The study reveals that EPIC 228735255b is as massive as Jupiter and has a radius of about 1.09 Jupiter radii. Therefore, it has a bulk density approximately 27 percent lower than that of Jupiter, which suggests that the planet is slightly inflated. EPIC 228735255b has an non-circular orbit with an eccentricity of 0.12 and circles its parent star every 6.57 days. The predicted equilibrium temperature of the planet is 1,114 K.
All these parameters indicate that EPIC 228735255b is another example of a "hot Jupiter" exoplanet. The so-called "hot Jupiters" are gas giant planets, similar in characteristics to the solar system's biggest planet, with orbital periods of less than 10 days. They have high surface temperatures, as they orbit their host stars very closely. 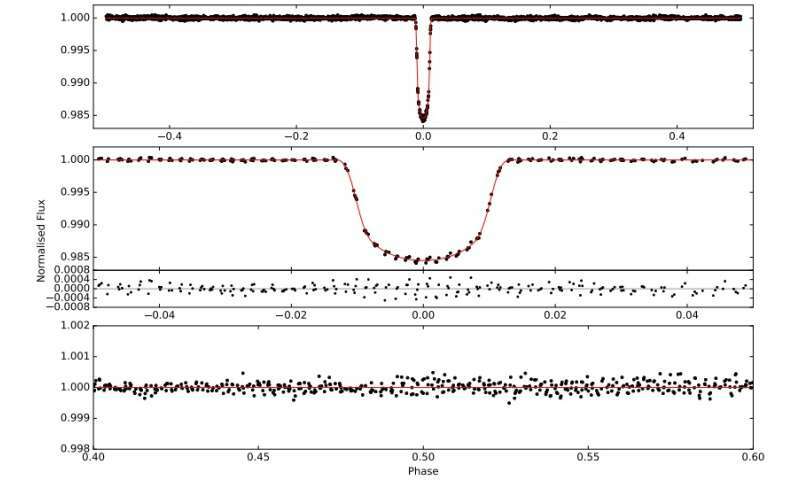 According to the paper, EPIC 228735255b is so far the ninth "hot Jupiter" detected by K2 mission and the third-longest period giant exoplanet found by this spacecraft. The researchers acknowledged that the new exoworld has a period longer period than 94 percent of giant planets discovered from ground-based transit surveys. "This discovery is the ninth 'hot Jupiter' from K2 and highlights K2's ability to detect transiting giant planets at periods slightly longer than traditional, ground-based surveys," the astronomers concluded. We present the discovery of EPIC 228735255b, a P= 6.57 days Jupiter-mass (MP=1.019±0.070 MJup) planet transiting a V=12.5 (G5-spectral type) star in an eccentric orbit (e=0.120+0.056−0.046) detected using a combination of K2 photometry and ground-based observations. With a radius of 1.095±0.018RJup the planet has a bulk density of 0.726±0.062ρJup. The host star has a [Fe/H] of 0.12±0.045, and from the K2 light curve we find a rotation period for the star of 16.3±0.1 days. This discovery is the 9th hot Jupiter from K2 and highlights K2's ability to detect transiting giant planets at periods slightly longer than traditional, ground-based surveys. This planet is slightly inflated, but much less than others with similar incident fluxes. These are of interest for investigating the inflation mechanism of hot Jupiters. Where has all the methane gone?